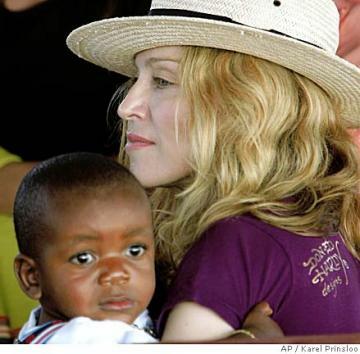 But Madonna’s obsession with Malawi may now have some big hurdles. Last year Madonna hired and fired Banda’s sister Anjimile Oponyo from running her never-built leadership academy. It was a very big scandal in Malawi. Madonna had contracted to pay a whopping $380,000. Then it turned out no one knew where the money was going, and Madonna’s charity, Raising Malawi–a front for the Kabbalah Center of Los Angeles–was investigated by the IRS. IRS reported exclusively that a grand jury was convened to figure out where millions had gone. Anjimile Oponyo and the other workers contracted for the leadership academy sued Madonna, who of course counter-sued. The case was finally settled out of court, with Madonna agreeing to pay about $150,000 to Oponyo and other dismissed workers. The whole episode left a bad taste behind for all concerned. Now Oponyo’s sister is president of the country. And Joyce Banda has her own successful foundation and charity in Malawi that builds schools and helps children.